Twins of Flight by Ben Harjo Jr. Since 1980, the Fellowship Program has afforded us the opportunity to recognize and support both emerging and established Native artists, said SWAIA’s Chief Operating Officer Dallin Maybee. The Southwestern Association for Indian Arts (SWAIA) is pleased to announce this year’s Indian Market artist fellows in the Discovery, Design and Youth categories. SWAIA is the non-profit organization that produces Indian Market and plays an ongoing role in supporting Native American arts and culture through the year. “Since 1980, the Fellowship Program has afforded us the opportunity to recognize and support both emerging and established Native artists,” said SWAIA’s Chief Operating Officer Dallin Maybee. This year’s Discovery Fellows are Feather Metsch (Odawa), Melissa Melero-Moose (Northern Paiute) and David McElroy (Choctaw). The SWAIA Discovery Fellowship assists Native artists in the exploration of their artistic process and encourages pushing the boundaries of their respective art form. Traditional or contemporary, emerging or established; this fellowship rewards artistic innovation and encourages applicants to expand their work into undefined areas. The fellowship funds may be used to purchase materials, equipment and cover research expenses (including travel), but a detailed project plan must accompany the fellowship applications. Discovery Fellows receive a monetary award of $3,500, plus a complimentary booth at Indian Market the year they win (excludes writers and filmmakers). This year’s 2016 Design Fellowship winner is Benjamin Harjo, Jr. (Seminole/Absentee Shawnee). Harjo is a visual artist and a distinguished alumnus of Oklahoma State University. 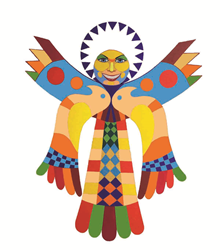 Two of his paintings, Twins of Flight and I Could Have Been a Peacock will be used by Christus Health Plan (an Indian Market sponsor) to create two 11x17 promotional posters that they will give away during Market. Twins of Flight will also be the featured art on commemorative T-shirts, and I Could Have Been a Peacock will be featured on collector tote-bags. Both of these items, along with many others, will be sold at the Indian Market merchandise booths on the Plaza and at the Convention Center. “Being recognized by SWAIA as the 2016 poster artists was a great surprise and I feel very honored and thank the selection committee for their support of all our artistic endeavors,” said Ben Harjo Jr. This year’s Youth Fellowship winners are Sam Slater (Navajo), Gracie Aragon (Acoma Pueblo), Jordyn Atencio (Ohkay Owingeh Pueblo) and Apaolo Benally (Navajo). All applicants to Santa Fe Indian Market and the Fellowship Program must be members of a federally recognized tribe. Feather Metsch is a trans-disciplinary artist who works in interactive digital storytelling using performance, installation and telecommunication. She creates immersive environments to tell digital stories from an indigenous perspective. She will be using her Discovery Fellowship monies to return to her ancestral homeland in Michigan and produce a 360-degree video. Melissa Melero is a mixed-media painter working on a series of paintings inspired by the basketry of the Great Basin region. David McElroy is a jeweler, sculptor and metalworker. His project involves creating large seed pots in silver and gold. Seed pots are traditionally made of ceramic or clay and used to protect and store seeds. 18-year-old Sam Slater is a Navajo writer, poet and visual artist who was raised in suburban Maryland. He is currently working on a project exploring his Navajo heritage.